Farmers cooperate to implement agro-environmental measures in specific management areas to achieve a common environmental goal: the conservation of farmland birds. Rural Flanders faces a range of environmental problems including the decline of farmland birds. To reverse this decline the government determined “management areas” in which farmers are encouraged to take specific agro-environmental measures (AEM’s). 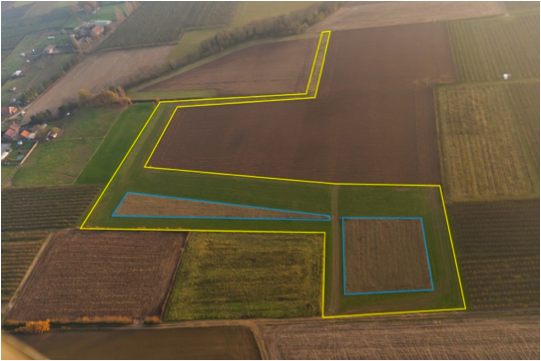 They can only start if the area where they will apply these measures covers a minimum threshold, so farmers need to collaborate in order to address this land coverage requirement. The main objective of the project is to stimulate cooperation between farmers to achieve the common goal of reversing the decline in farmland birds within defined management areas and create common responsibility. Farmers create grassy field margins, which are managed in different (2 or 3) parallel strips. They agree to leave part of the field margins unmown. This management assures that there are always strips with longer vegetation available for refuge and nesting habitats. For winter feeding, farmers also sow wheat that they do not harvest. The yellow outline (top-right photo) shows grassy strips, blue is wheat for birds. Left photo shows parallel strips (mown/unmown) with wheat on both sides. Farmland birds are increasing both in winter and in summer. Rarer birds of prey are more common because of the greater numbers of farmland birds, and in particular because of the presence of field mice. 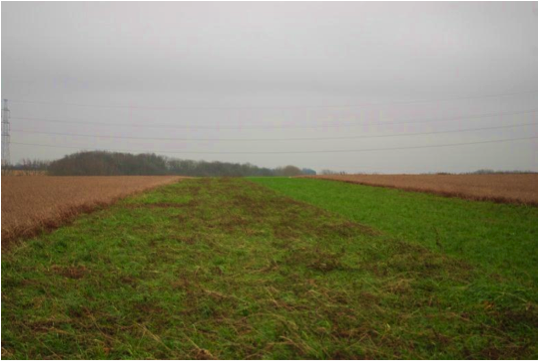 Not only do farmland birds benefit, but soil erosion is also reduced to a minimum. It is possible for farmers to work together in a group for a common goal, provided that: i) farmer knows and understands the possibilities ("unknown is unloved") and; ii) they are supported to take action and feel confident they will achieve the common goal. When farmers embrace cooperation they also feel less concerned about mutual competition. The project is located in the Belgian province of Limburg, municipality of Halen.